Comprehensive Economic and Trade Agreement is set to increase Free trade between the European Union and Canada. It has the aim of providing more business opportunities and a better environment for important personnel, professionals, service-suppliers, and short-term business visitors to carry out their activities in Canada. It is designed to eliminate 98 % tariffs between the EU and Canada. CETA comes into effect on September provisionally, and several member states have so far not ratified it. The Canadian government estimates that CETA will boost bilateral trade by 20 %. 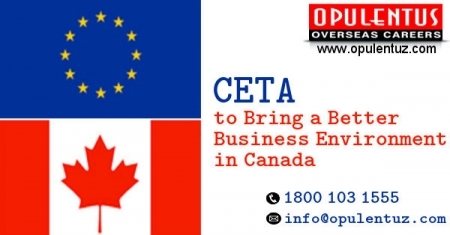 CETA will allow the entry of a few businessmen who are citizens of Canada and EU states by removing the requirement for LMIA which was needed prior to doing any work in Canada legally. The Labour Market Impact Assessment (LMIA) guarantees that Canadian companies can only hire at the international level when no Canadian citizens or PRs are ready and able to do that work. It includes advertising the requirements and more processing time. An exemption here makes the process easy. Business visitors arriving for a short duration. LMIA exemption codes have been created to capture data about EU business visitors. These exemptions are envisaged in the International Mobility Program using which the government goes for better cultural and economic relations and provides a competitive advantage for the country. Graduate trainee applicants are required to possess a university degree and must be transferred temporarily to a Canada based enterprise for career development/ training. Eligible investors can stay for a year. The investor must establish/ develop/ administer the investment and play a supervisory or executive role be the investor, and be employed by an enterprise committed to bringing substantial capital. A few categories of Engineering and Scientific Technologists can enter Canada without having a university degree. If you have an enquiry related to working in Canada, please contact us at [email protected] or call us 1800 103 1555. Our experts will meet your expectations and provide answers to queries.